For the genus of spiders of the same name, see Nihoa (spider). Not to be confused with Nihao. The island is home to 25 species of plants and several animals, making it the most diverse island in the entire NWHI. Endemic birds like the Nihoa finch and Nihoa millerbird, and endemic plants like Pritchardia remota, Schiedea verticillata, and Amaranthus brownii are found only on Nihoa. The plant communities and rocky outcrops provide nesting and perching areas for 18 species of seabirds, such as red-footed boobies and brown noddies, terns, shearwaters, and petrels. Prehistoric evidence indicates Native Hawaiians lived on or visited the island around AD 1000, but over time the location of Nihoa was mostly forgotten, with only an oral legend preserving its name. Captain James Colnett rediscovered the island in 1788, and Queen Kaʻahumanu visited it in 1822. It was made part of the Kingdom of Hawaii by King Kamehameha IV. In 1909, Nihoa became part of the Hawaiian Islands Reservation, a federal wildlife refuge established by U.S president Theodore Roosevelt. The Tanager Expedition surveyed the island in 1923, taking a comprehensive biological inventory of its many species. In 1940, it became part of the Northwestern Hawaiian Islands Wildlife Refuge and in 1988, it was listed on the National Register of Historic Places due to its culturally significant archaeological sites. In 2006, it became part of the Papahānaumokuākea Marine National Monument. Efforts are underway to ensure that endangered plant species are propagated beyond their limited range and represented in ex situ collections. Persons intending to visit Nihoa for cultural and scientific research purposes require a USFWS-issued special-use permit to land on the island so as to reduce the risk of introducing alien species to Nihoa's already fragile ecosystem. 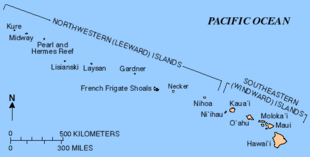 Nihoa is part of the Hawaiian – Emperor seamount chain of volcanic islands, atolls, and seamounts starting from the island of Hawaiʻi in the southeast to the Aleutian Islands in the northwest. 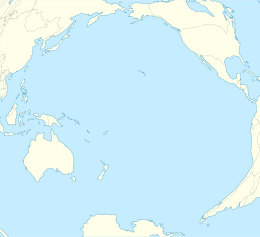 It is the youngest of ten islands in the uninhabited Northwestern Hawaiian Islands (NWHI), having formed 7.2 million years ago; the oldest, Kure Atoll, formed 30 million years ago. Over the millennia, Nihoa has experienced significant erosion; along with Necker, French Frigate Shoals, and Gardner Pinnacles, Nihoa is one of only four islands in the NWHI that still has an exposed basalt rock substrate. Six valleys slant down from north to south, meeting at the south side of the island: West Valley, West Palm Valley, Miller Valley, Middle Valley, East Palm Valley, and East Valley. 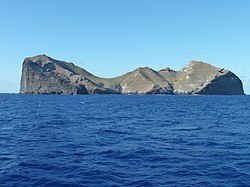 Nihoa's inaccessibility and lack of major guano deposits made the island unattractive to humans, helping to preserve its endemic species from extinction. Because of Nihoa's small size, most of its endemic organisms are endangered, as one single disaster such as an island-wide fire or an introduction of invasive species could wipe out the whole population. One such invasive species is the gray bird grasshopper, Schistocerca nitens; from the period between 1999 and 2003, grasshoppers devastated much of the vegetation on the island and posed a real threat to the continued health of plants on Nihoa. The following year, the numbers decreased and the vegetation became lush again. The grasshoppers probably came to Nihoa by way of wind from Kauai. Nihoa was well known to the early Hawaiians. Archaeological expeditions found extensive prehistoric agricultural terraces and house sites. At least one site has been dated to around the 1st millennium AD, sometime between 867-1037. There is some doubt as to the number of people that lived on Nihoa, because while the large terraces suggest a considerable number, there is scant fresh water to be found. Archaeologists Kenneth Emory  and Paul Cleghorn  estimate that water could support as many as 100 people, although if the island were previously forested, this would have increased fresh water supplies relative to its current state. It is also thought that Nihoa may have been used only for religious purposes, which would have meant that ancient Hawaiians only visited here occasionally and did not stay for long. Because of the island's importance, the island was added to the National Register of Historic Places in 1988, and subsequently became part of Papahānaumokuākea Marine National Monument in June 2006. ^ Rauzon 2001, p. 8. Captain William Douglas, the second Western explorer to find Nihoa, describes the island as "[bearing] the form of a saddle, high at each end, and low in the middle. To the south, it is covered with verdure; but on the north, west, and east sides it is a barren rock, perpendicularly steep..."
^ Department of Forestry and Wildlife (2005). "Chapter 6: Northwestern Hawaiian Islands. Hawaii's Comprehensive Wildlife Conservation Strategy (CWCS)" (PDF). Hawai'i Department of Land and Natural Resources. Archived from the original (PDF) on March 22, 2012. ^ a b Tava & Keale 1998, pp. 102–103. ^ Hunt, Terry L.; Holsen, Robert M. (1991). "An Early Radiocarbon Chronology for the Hawaiian Islands: A Preliminary Analysis". Asian Perspectives. 30 (1): 157. hdl: 10125/19261. ISSN 0066-8435. ^ Emory, Kenneth P. (2003) . Archaeology of Nihoa and Necker Islands. Bishop Museum Bulletin. 53. Bishop Museum Press. ^ Cleghorn, Paul L. (1988). "The settlement and abandonment of two Hawaiian outposts: Nihoa and Necker islands". Bishop Museum Occasional Papers. Bernice Pauahi Bishop Museum. 28: 35–49. ^ Rolett, B.; Diamond, J. (2004). "Environmental predictors of pre-European deforestation on Pacific islands". Nature. 431 (7007): 443–446. Bibcode: 2004Natur.431..443R. doi: 10.1038/nature02801. PMID 15386010. ^ Rauzon 2001, p. 8. ^ Rauzon 2001, p. 12. Conant, Sheila (1985). "Recent Observations on the Plants of Nihoa Island, Northwestern Hawaiian Islands". Pacific Science. University of Hawaii Press. 39 (2): 135–149. hdl: 10125/921. Evenhuis, Neal L.; Eldredge, Lucius G., eds. (2004). Natural History of Nihoa and Necker Islands. Bishop Museum Bulletin in Cultural and Environmental Studies; No. 1. Honolulu, Hawaii: Bishop Museum Press. ISBN 1-58178-029-X. Liittschwager, David; Middleton, Susan (2005). Archipelago: Portraits of Life in the World's Most Remote Sanctuary. National Geographic. ISBN 0-7922-4188-6. MacDonald, Gordon A.; Peterson, Frank L.; Abbott, Agatin T. (1983). Volcanoes in the Sea: Geology of Hawaii (2nd edition). University of Hawaii Press. ISBN 0-8248-0832-0. Tava, Rerioterai; Keale, Moses K. (1998). Niihau, the traditions of a Hawaiian island. Mutual Publishing. ISBN 0-935180-80-X. Archived from the original on May 24, 2013. Rauzon, Mark J. (2001). Isles of Refuge: Wildlife and History of the Northwestern Hawaiian Islands. University of Hawaii Press. p. 12. ISBN 0-8248-2330-3. Beardsley, John W. (1966). "Insects and other terrestrial arthropods from the leeward Hawaiian Islands". Proc Hawaiian Entomol Soc. 19: 157–185. hdl: 10125/10915. ISSN 0073-134X. Clapp, Roger B.; Eugene Krindler; Robert R. Fleet (May 1977). F. R. Fosberg; M. -H. Sachet; D. R. Stoddart, eds. "The Natural History of Nihoa Island, Northwestern Hawaiian Islands" (PDF). Atoll Research Bulletin. Washington, D. C.: Smithsonian Institution (207). Archived from the original (PDF) on September 13, 2006. Retrieved 2008-12-07. Cleghorn, Paul L. (1987). Prehistoric Cultural Resources and Management Plan for Nihoa and Necker Islands, Hawaiʻi. Honolulu: Bishop Museum Press. Gagné, Wayne C.; Sheila Conant (1983). "Nihoa: Biological Gem of the Northwest Hawaiian Islands". Ka ʻElele. Newsletter of the Bernice P. Bishop Museum Association. Bernice P. Bishop Museum (7): 3–5. Hawai'i Department of Land and Natural Resources (2008). "Papahanaumokuakea Marine National Monument Management Plan: Appendix A - Cultural Impact Assessment" (PDF). Volume II: Final Environmental Assessment. U.S. Fish and Wildlife Service. Archived from the original (PDF) on May 15, 2009. Retrieved 2009-09-30. Juvik, Sonia P.; James O. Juvik; Thomas R. Paradise (1998). Atlas of Hawaii. University of Hawaii Press. ISBN 978-0-8248-2125-8. Kirch, Patrick Vinton (1985). Feathered Gods and Fishhooks: An Introduction to Hawaiian Archaeology and Prehistory. University of Hawaii Press. ISBN 9780824819385. Lebo, Susan A.; Kevin T.M. Johnson (2007). "Geochemical sourcing of rock specimens and stone artifacts from Nihoa and Necker Islands, Hawiʻi". Journal of Archaeological Science. Elsevier. 34 (6): 858–871. doi: 10.1016/j.jas.2006.08.009. Olson, Storrs L. (1996). "History and ornithological journals of the Tanager Expedition of 1923 to the northwestern Hawaiian Islands, Johnston and Wake islands". Atoll Research Bulletin. National Museum of Natural History (433). Palmer, H. S. (1927). "Geology of Kaula, Nihoa, Necker and Gardner Islands, and French Frigate Shoals". Bernice P. Bishop Museum Bulletin. Tanager Expedition Publication Number 4. 35. Wong, Sterling (2008). "Nihoa". Ka Wai Ola. Office of Hawaiian Affairs. 25 (11): 12. Wikimedia Commons has media related to Nihoa.